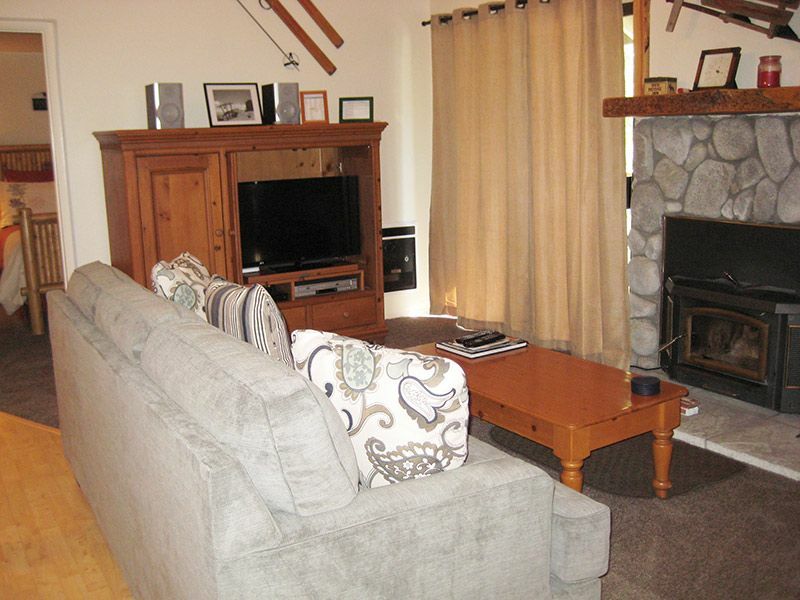 This is a beautiful and cozy condominium with lots of wonderful mountain decorations in every corner! It is a nonsmoking, 1-bedroom and a loft unit with 2 bathrooms and a 4 star rating. It has a full kitchen, microwave, fireview woodburner, 3 flat screen TVs, a DVD player in both the living room and master bedroom plus a stereo with a cd player. The living room has HD cable in addition to high-speed wireless internet access. This unit also has a very nice panoramic view of the Sherwin Mountains. The master bedroom has a queen size bed and the loft has a queen bed and a set of bunkbeds with a queen on the bottom and single on the top. There are 2 1/2 flights of stairs to reach this unit (but well worth it) and it has 2 levels inside. The entry level has the living room, kitchen, bedroom and a bathroom. Upstairs is the loft with another bathroom. This unit sleeps up to 6 people. Walking to the Village Gondola from this unit is considered 2 blocks. Unit managed under Mammoth Lakes Business Tax Certificate 864. Clean, close to village, plenty of room for 6 but we only had 4 so more than enough room! Would easily stay here again!